Help CentreSuperControl AGENCY features Commission reportingHow do I pay myself commission? Once you have paid your owners it is important to remember to mark off your commission as paid. Paying owners works independently with feeding over to the bank reconciliation report and will not include your commission until you mark it as paid. This is because for many agencies you may not necessarily pay yourself on the same date you pay your owners. 5. 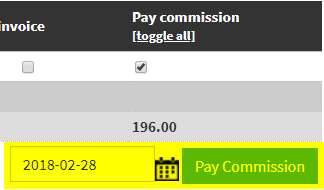 Select the date you wish to pay your commission and click "Pay commission". 6. Now your commission values will pull through onto the bank reconciliation report (Agency > Reports > Reconcile bank). Prev: How can I report on commission taken on specific extras?